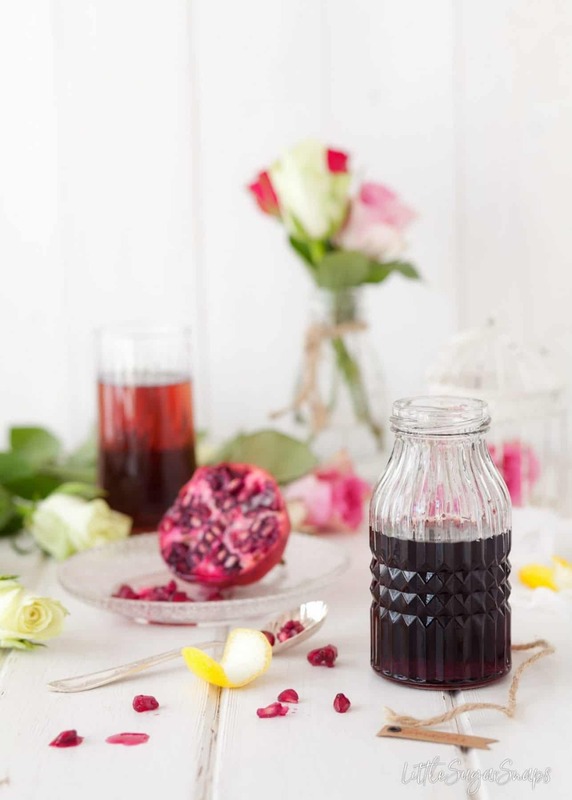 This Sparkling Pomegranate Lemon Cooler uses homemade grenadine to create a non-alcoholic drink ideal for a party. 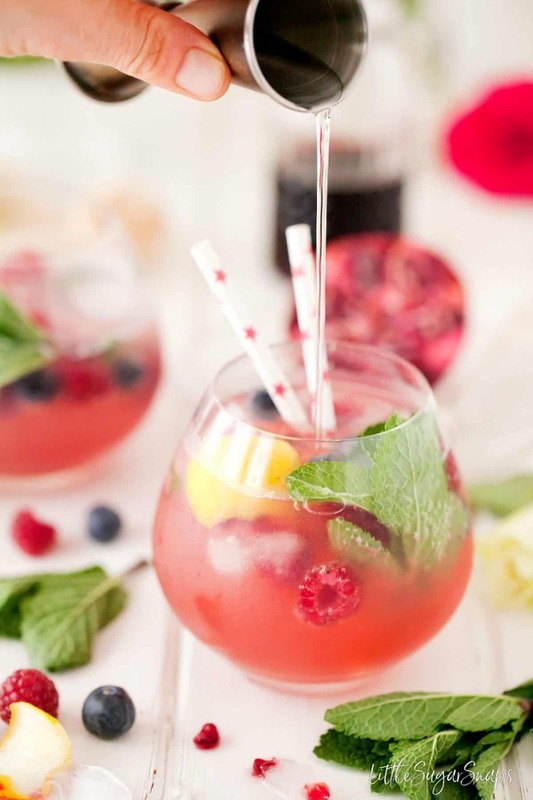 Loaded with fresh fruit and mint leaves it’s a very pretty drink to serve. Add a splash of vodka or gin for a boozy hit. One of the perks of blogging is getting to make friends with fellow bloggers from all over the world. You’d be amazed how much people, who have often never met face to face, can have in common. 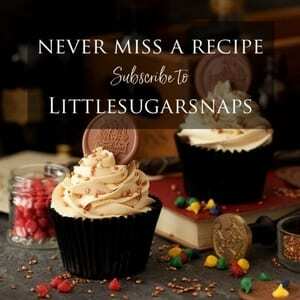 Having a bunch of blogger friends helps keep me sane as I stumble my way through the ever changing world of blogging. Today, I get to help celebrate a major life event for one such blogger friend – Meghan from the food blog Fox and Briar. 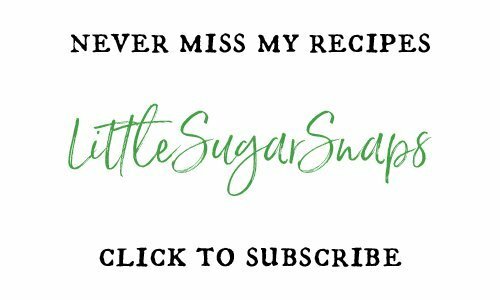 Meghan has just had a baby so I’ve teamed up with some fellow food bloggers to host a virtual party to mark this happy occasion. Since Meghan is American it’s okay for me to call it a #virtualbabyshower, right? 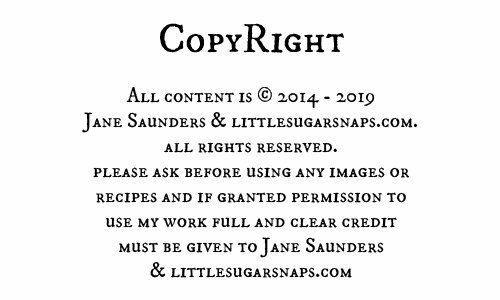 Anyway, the idea is that we each contribute a recipe to the virtual party and share all of the party goodies on our blogs. You can then hop over and scoop a lot of party recipes today. But before all of that, let me introduce you to Meghan’s blog. Fox and Briar is definitely a place I’d recommend visiting if you have a few spare minutes. You won’t be disappointed. Getting back to the baby party, what could be better than a drink that can serve as a mocktail or a cocktail depending on your post pregnancy alcohol stance? With that notion in mind, I I created a Sparkling Pomegranate Lemon Cooler. 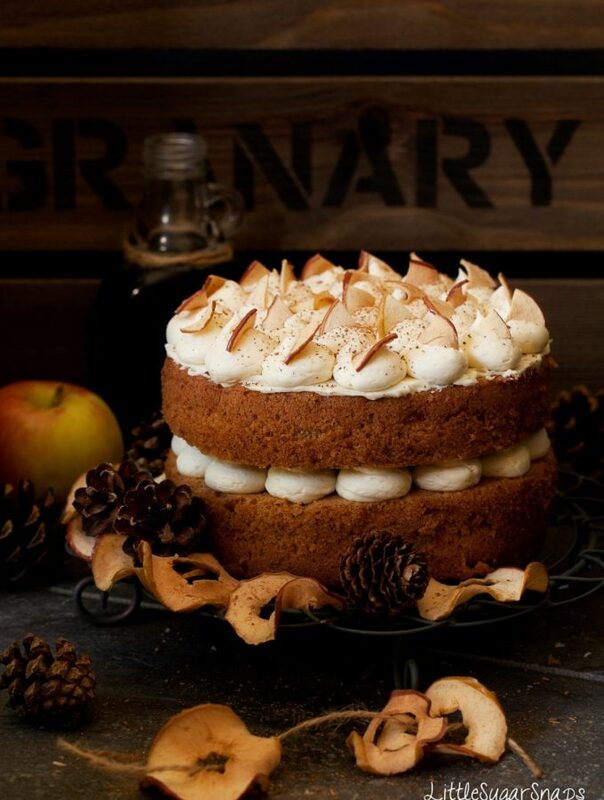 It can be served just as it is or laced with a tipple of vodka or gin. The star ingredient in this drink is the homemade grenadine. Made from pomegranate juice, it takes just a few minutes to make and beats store bought hands down since there are no nasty numbers or unfamiliar items floating around in the list of ingredients. 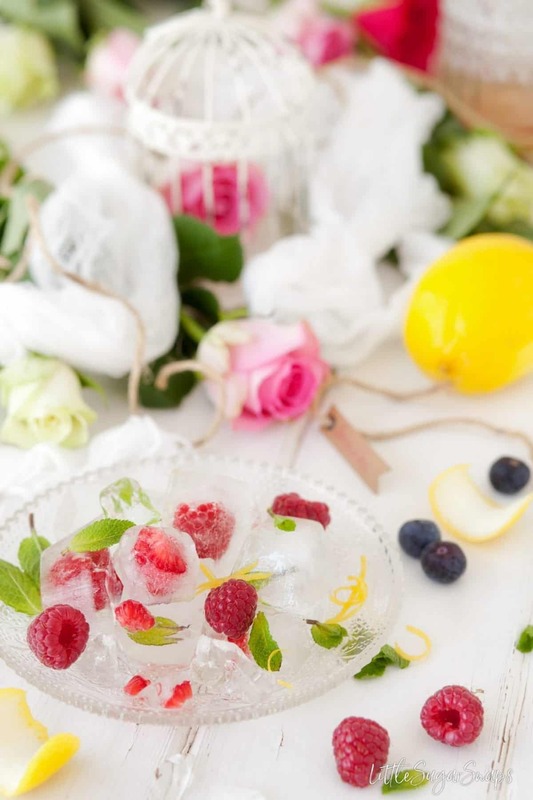 To make this Sparkling Pomegranate Lemon Cooler extra special, I recommend taking the time to prepare some ice cubes that have fresh berries or mint leaves added prior to freezing. It makes an exceptionally pretty drink. Fresh berries and mint leaves added directly to the glass are always welcome too. I’ve topped the grenadine, fancy ice cubes and fresh goodies with sparkling cloudy lemonade to create a drink that is fresh & fruity with a touch of tartness about it. Adding vodka or gin to this Sparkling Pomegranate Lemon Cooler is the ideal way to turn this mocktail into a cocktail and keep all palates happy. Just don’t get the glasses muddled up. 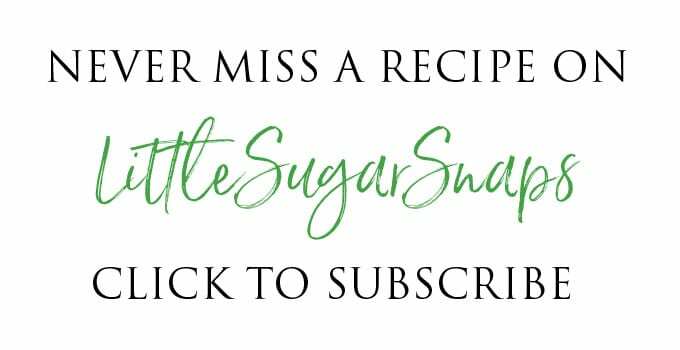 That’s my recipe sorted, so it’s time to find out what the rest of my blogger friends have come up with for our celebration. Tamara from Beyond Mere Sustenance has brought some rather pretty salmon to the table. It’s been cured with beetroot and gin. Sigh. The perfect light bite. 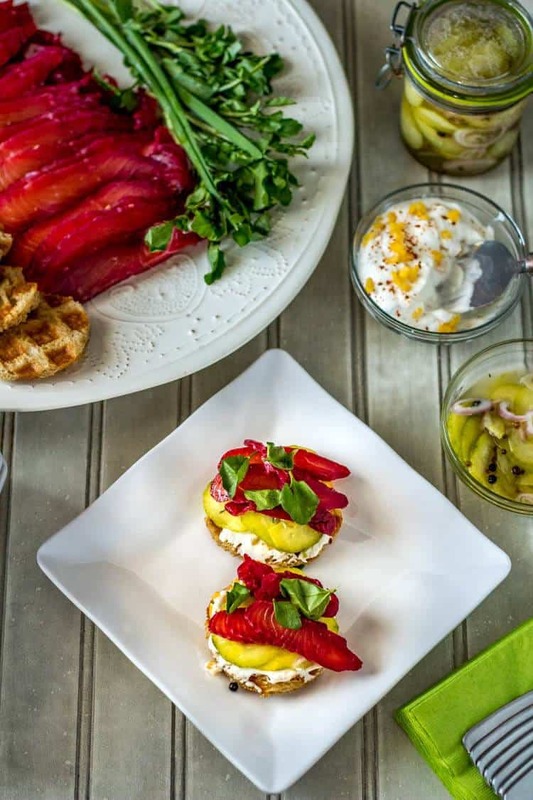 Christine from MidlifeCroissant comes laden with a stunning Spring Potato Salad. 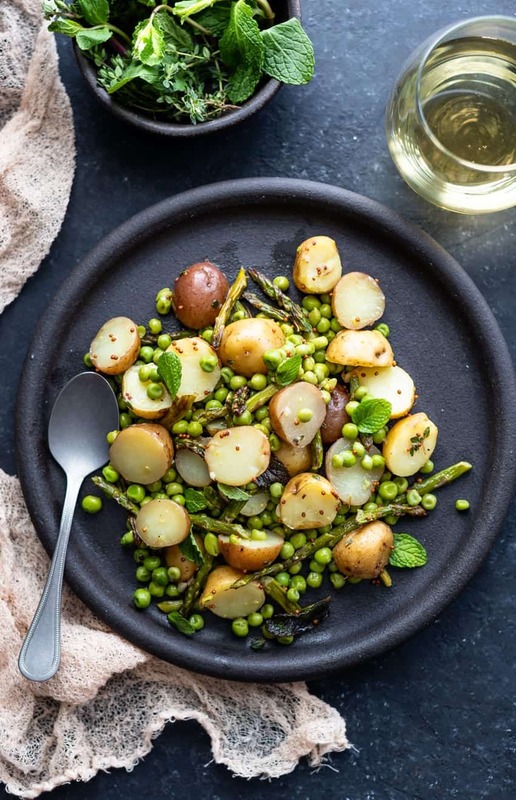 I’m very much in love with the look of this dish as I have a mild pea obsession (I ran out of peas yesterday – major trauma). 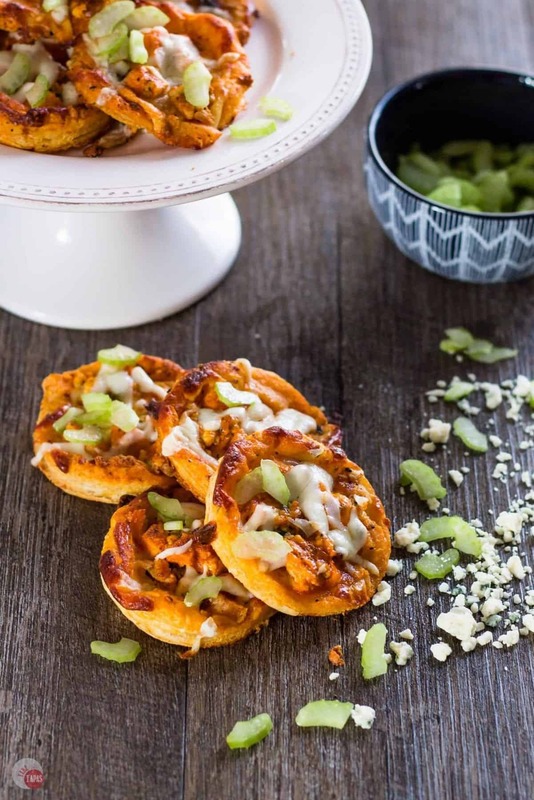 Jennifer from Take Two Tapas has whipped up some BBQ Buffalo Chicken Tart Mini Pizza. These are party gems because they can be held in one hand leaving your other hand free for … oh… um… hanging onto your drink. And after all these delectable bites it’s time to wrap up this virtual party with another drink. 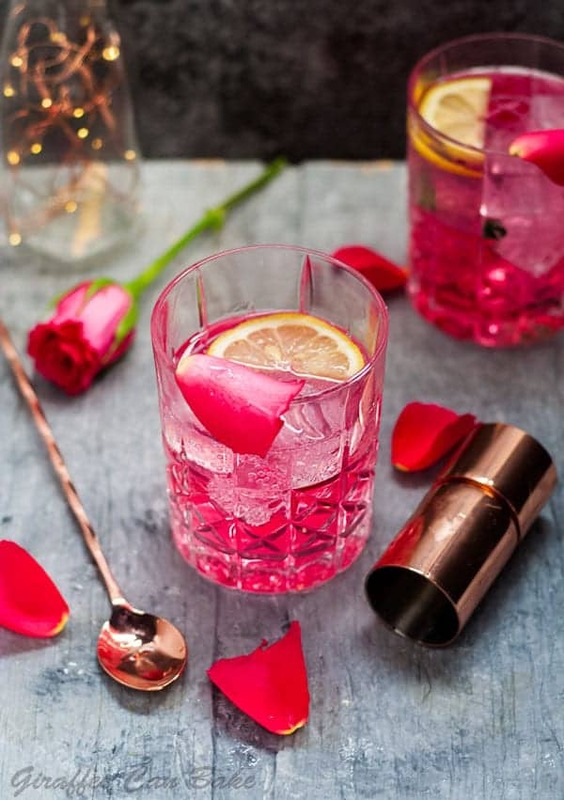 Michelle from Giraffes Can Bake comes armed with a particularly pretty Rose Vodka Tonic. When a drink is this good to look at it would be rude not to have one. And that brings this little #virtualbabyshower to a close. I hope you’ve enjoyed all of these additional recipes. All of the bloggers mentioned today are amazing ladies. 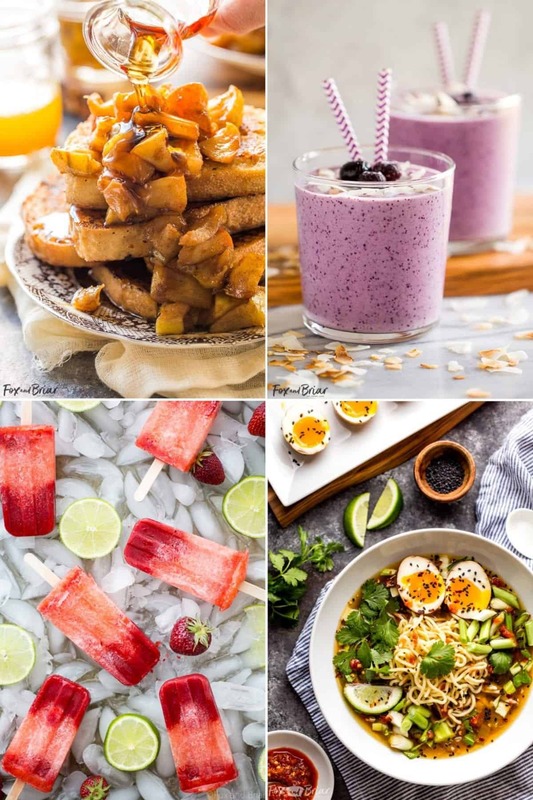 They are passionate about food, extremely creative and hard working (a pre-requisite of being a food blogger) and they are the business when it comes to being supportive. Do check out their other work – you’ll be in for a treat. This Sparkling Pomegranate Lemon Cooler uses homemade grenadine to create a non-alcoholic drink ideal for a party. 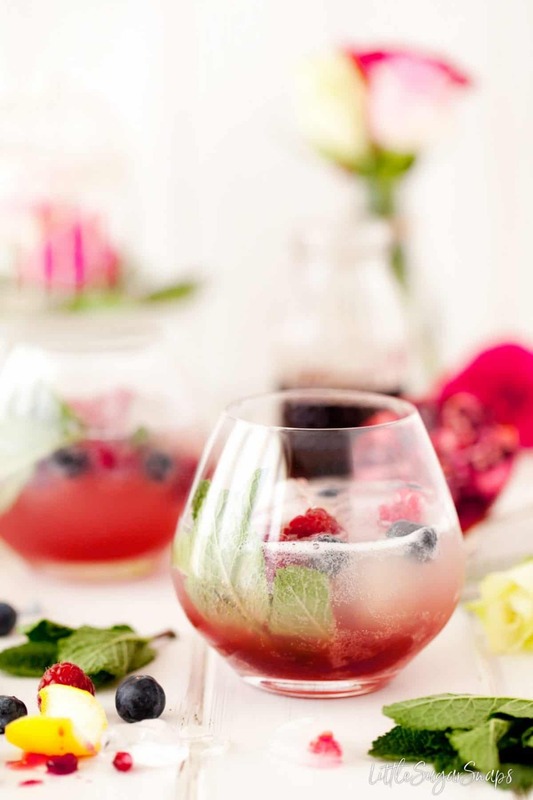 Loaded with fresh fruit and mint leaves it's a very pretty drink to serve. Add a splash of vodka or gin for a boozy hit. Makes enough grenadine for 12-15 servings. Add 1/3 of the lemonade and the vodka or gin (if using). Stir briskly. One of my favorite aspects of blogging is getting to know bloggers from all over the world! Sometimes, you gals keep me sane (and keep me from giving up too!). Planning a #virtualbabyshower for our friend Meghan has been so much fun! I love your Sparkling Pomegranate Cooler. I’m all over the idea of making my own grenadine, as I try to avoid long words that sound nasty… Hubby and I are trying to replace some of our boozy beverages with mocktails, so I’m excited to give this a whirl (both versions)! Cheers to Meghan, Mr. Fox, and baby! I feel exactly the same. If it weren’t for a certain somebody in our support group I’d have quit blogging 11 months in when my site broke for 3 weeks in 2015. You’ve done an amazing job getting us all organised for this little party – I hope you get chance to sit back and enjoy a cocktail (perhaps with the homemade grenadine) before too long. You just made it a lot easier for me to stay hydrated this summer. The weather is actually perfect for it today…I may be on my way to the market! Happy Baby Shower Day! Excellent. I think you’ll enjoy homemade grenadine in your cocktail making too. Jane, this is absolutely stunning! I have been wanting to try to make grenadine for awhile now and I’m so glad to have your recipe! Our little blogging community really is the best, I couldn’t do it without you ladies! And I’m not sure I can do this weekend without trying this Pomegranate Lemon Cooler either (WITH booze, of course!). I’ve never made my own grenadine so I really need to get on that ASAP!